Over time, I hope to try every ramen restaurant in Ottawa. What with ramen becoming more popular, this process has become more difficult, but I think I’ll manage! 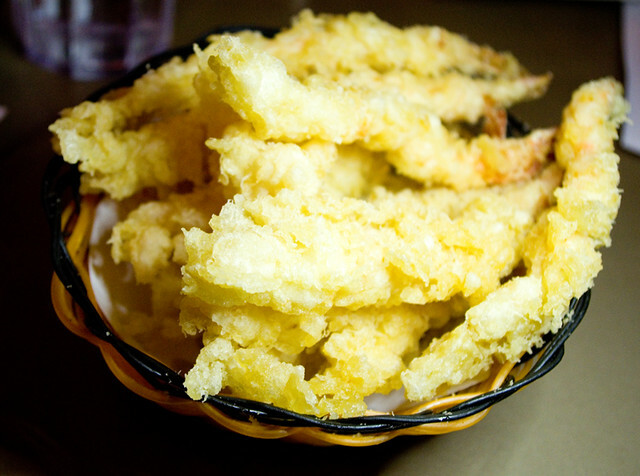 Recently I had the chance to check out the Sansotei Ramen location at 1537 Merivale Rd. A few things you should know before I even talk about the food: they’re closed Mondays, they don’t take reservations, and they’re really popular right now due to positive reviews in the paper. The last two factors mean that even if you arrive shortly after opening for dinner, as we did, there’s going to be a wait. 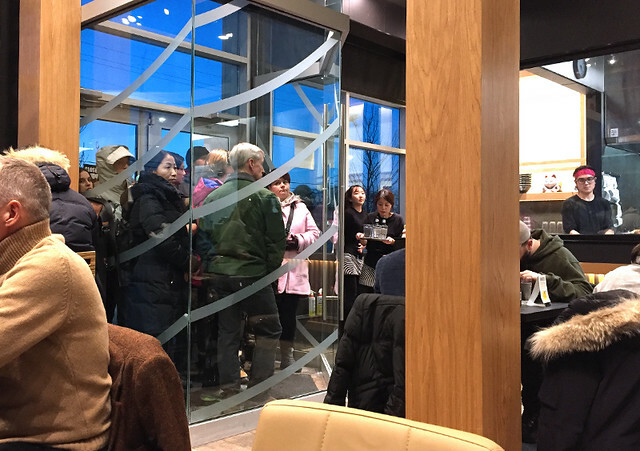 The line only gets longer as you progress further in to the dinner hour, with people squashed into the tiny vestibule awaiting their turn, and then a line going out the outer door and down the sidewalk. Although turnover was fairly quick (ramen is generally supposed to be a quick meal), the entrance looked like the above the entire time we were there — although to be fair, it was a Saturday. Now to the food. 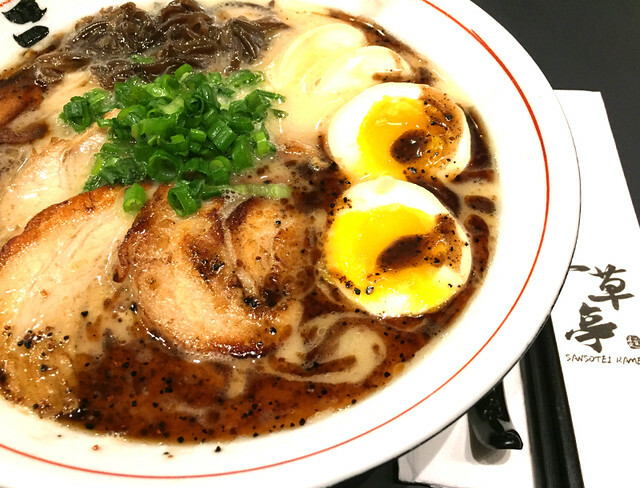 I tried the tonkotsu ramen black (i.e. pork bone broth with black garlic oil) with chashu pork, which is one of my favourite dishes. It’s also one of the more complicated ones to make, so I find that it’s a pretty good test of a restaurant. I was very happy with my soup! 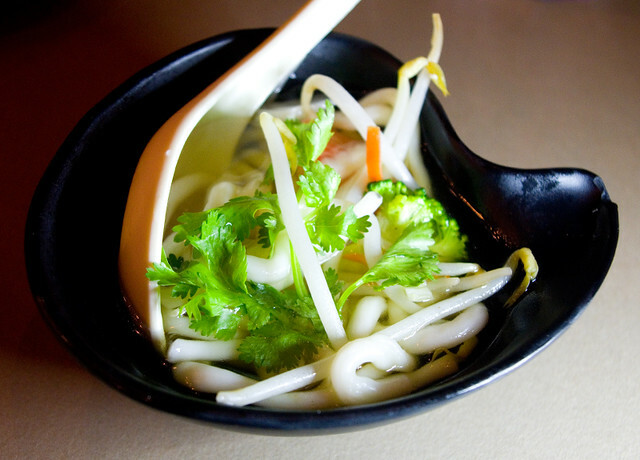 The broth was rich without being too fatty, and bursting with flavour. The pork was melt-in-your-mouth. The noodles had just the right amount of chewiness. I have to admit that my favourite ramen place in Ottawa is still Koichi Ramen (formerly Ginza Ramen) in Chinatown, but Sansotei is definitely giving them a run for their money. I would definitely recommend this restaurant; it’s well worth the wait in line. One of the things that I really like about birthdays is that it usually means going out for dinner. When it’s a large group of people like it was for the dual birthdays this past weekend, that usually means a kind of place where everyone can find at least one thing that they like — which often means a buffet or all-you-can-eat kind of place. This year my friends chose 168 Sushi Buffet. We’ve eaten there for a number of other celebrations, and it’s usually pretty good food. I mean, it’s not fancy, no bones about it, but it gives everyone a chance to try a little bit of everything, and I really like that. As a bonus, this meal gave me the chance to try out the little ring light that I had purchased during my visit to the US in the fall. Restaurant lighting is notoriously bad (it’s generally kept low for “ambience” — and often to conceal a multitude of flaws), and it’s not like you can set up a tripod in the close quarters between tables. One of my friends was nice enough to act as my light stand, though, so I think I captured a few decent pics. 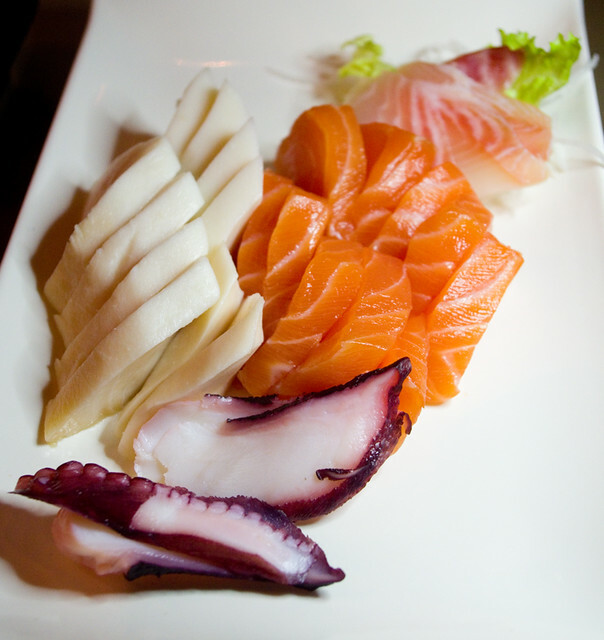 Above we have a group order of sashimi. 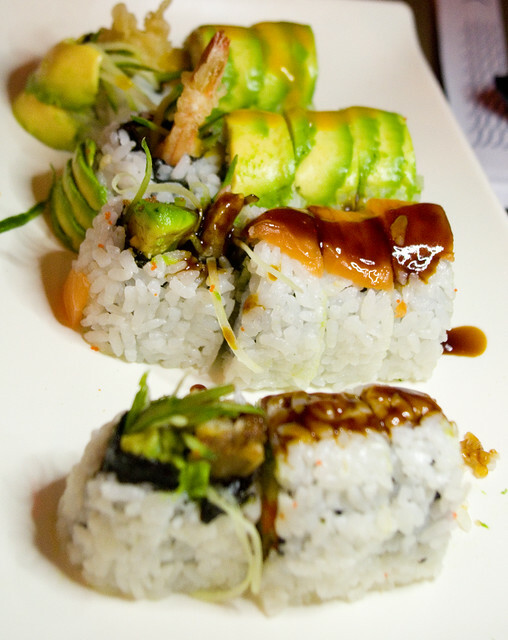 Rolled sushi (dragon rolls I think). Every other dish went by me so quickly and was picked clean so fast that I didn’t have a chance to get pictures! I mean, it’s not like I wasn’t involved in that process or something, but I found it funny. So, would I recommend this restaurant, and others in this style? Most definitely! Don’t go in expecting something high-end, but you will get your fill of good food. It’s also extremely popular! There was a long line from the time we arrived to the moment we left. After all of the work (and many hours of ingredient hunting) over the weekend for Sunday’s dinner, I thought I’d keep things a bit more simple on Monday night. 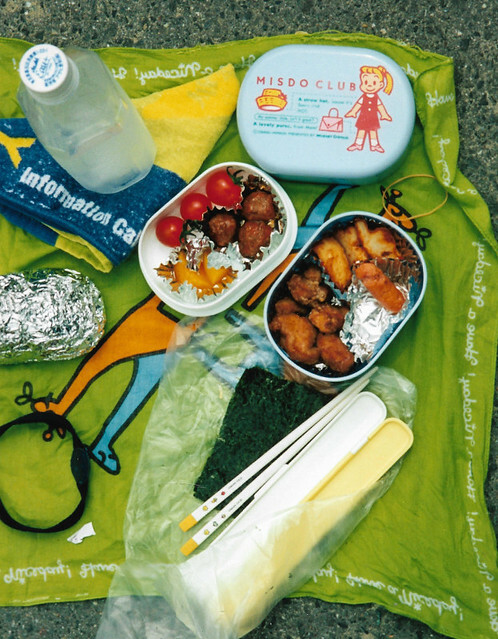 I’d been meaning to try out some of the recipes from Ten-Minute Bento (Megumi Fuji, 2007), since they all looked delicious and relatively simple. I went through my cupboards to determine what I already had, prepped my shopping list, and then went out for the day. Easy peasy, right? Except that halfway through the day my eldest called from school to tell me she was feeling sick, and could I come and pick her up. So much for picking up the missing ingredients with the girls after school, then. Instead of the leisurely dinner prep I had been hoping for, I chucked the rice in the Instant Pot right before my husband came home, made a mad dash for the grocery store once he arrived, and returned home as quickly as possible. I know, I could have changed my dinner plans entirely, but at this point it would probably have taken longer to find another recipe, scrounge the house for ingredients, and likely defrost something from the freezer. Luckily the recipes in this book are as simple as described, if not necessarily as quick. (It’s not a ten-minute bento if you have to cook the rice, marinade the fish for ten minutes, and then grill each side of the fish for 4 minutes per side. Just saying.) 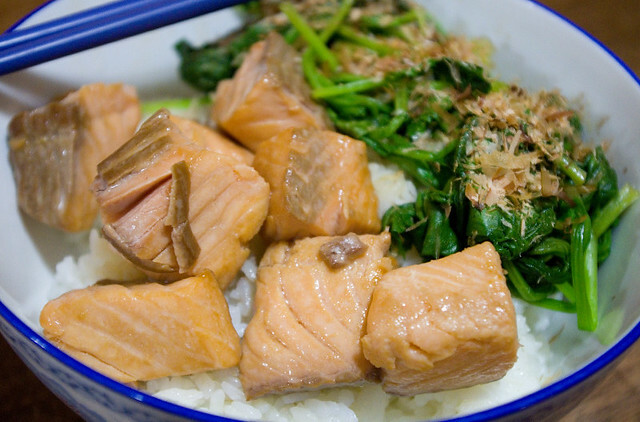 I upped the portions to make the bento on page 21 for four people, and we all greatly enjoyed our yuan-style salmon & spinach with bonito flakes. I would definitely make this recipe again. Honestly, if it hadn’t been for circumstances delaying me from getting the ingredients earlier, it would have been a snap! As a bonus, making the sticky rice in the Instant Pot was super easy and came out perfectly. Since the stew the night before took a while to prepare — not so much the cooking, but all of the chopping and cutting — I thought that last night I would make something a bit more simple. I wanted to continue testing out (okay, playing with) my new Instant Pot, so I used it to make a batch of basmati rice. I used the instructions for rice that I found on page 51 of The Ultimate Instant Pot Cookbook (Coco Morante, 2018). I’ve made basmati rice about a million times on the stove and I’ve got it pretty much down to a science, but I wanted to see how the new cooker would compare. I don’t think it takes any less time once you take into account the preheating and the recommended-for-best-results ten minutes on Keep Warm after cooking, but it is pretty darned easy. Unlike the stove top version, I can more or less just set it and forget it, so I can see why a lot of people like this feature. I think I need to test it with some of the trickier varieties, like wild rice or sticky rice, before I am 100% convinced. 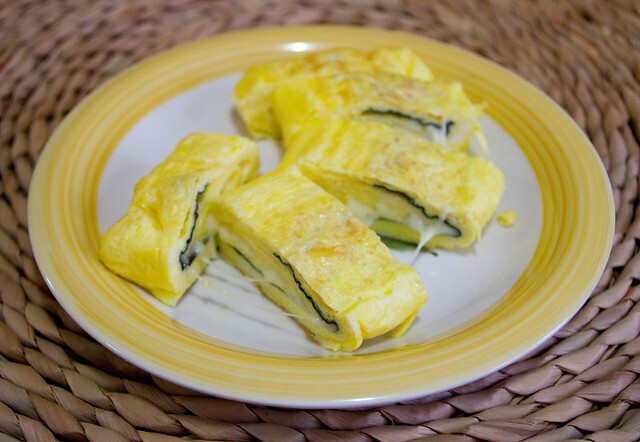 The topping for the rice was another attempt at Nori Cheese Tamagoyaki (video here). While this dish invariably comes out tasting excellent, I’m still working on the technique. I find that rolling the nori and egg are fine, but the cheese makes it tricky and it wants so badly to fall apart. Ah well, practice makes perfect. 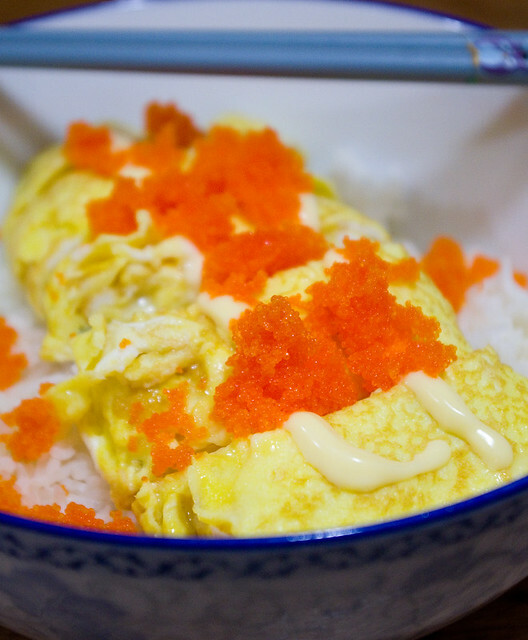 This time I topped it with Japanese mayo and masago (seasoned capelin caviar), as per the recipe, and I think that this transforms the omelette flavour-wise from a breakfast to a supper dish. Given the family’s rave reviews, this is definitely going to be a regular part of our diet, so I think that I’ll get all the practice I need! I thought that yesterday would be a good time to start trying out Christmas presents, and I used up almost a dozen eggs doing so. First I had to try out my tamagoyaki pan. I used the fillings from Tasty’s Nori Cheese Tamagoyaki recipe (video here), but I wanted to see how it would taste without the mayonnaise and tobiko toppings. I only ended up using one sheet each of nori and dairy-free havarti cheese because I was having a hard enough time rolling it as it was. I think I made each layer too thick, so I’ll try it with less egg per layer next time. Despite the loose, messy look of the omelet, my husband and children thought it was delicious! I rather liked it as well. As you can see in the picture, the cheese inside was nice and gooey, which I think was a big selling point. I think I’ll have to make it as a proper meal in the near future. 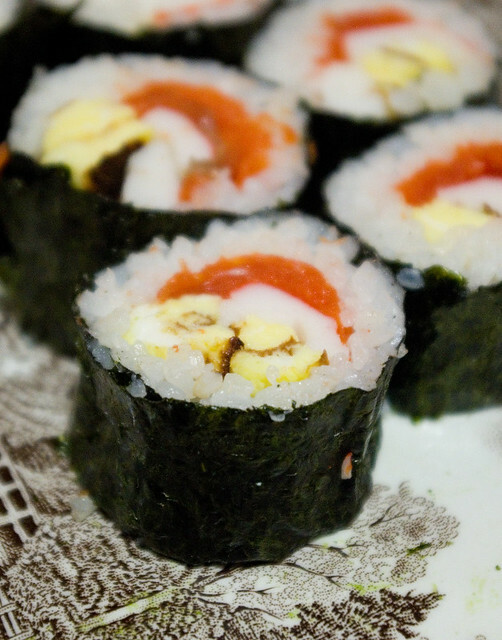 I’ll need to practice with a basic, filling-free tamagoyaki for sushi as well. Next I broke out the Instant Pot, first to read the instruction manual, and then to give it an initial test run as per the instructions. I was a little nervous to use it at first, since it is indeed a pressure cooker, and as I’ve stated before I find them a bit intimidating. It’s that evil sound of steam hissing out of them at velocity, I think, and photos like this one of what happens when a pressure cooker doesn’t vent properly. 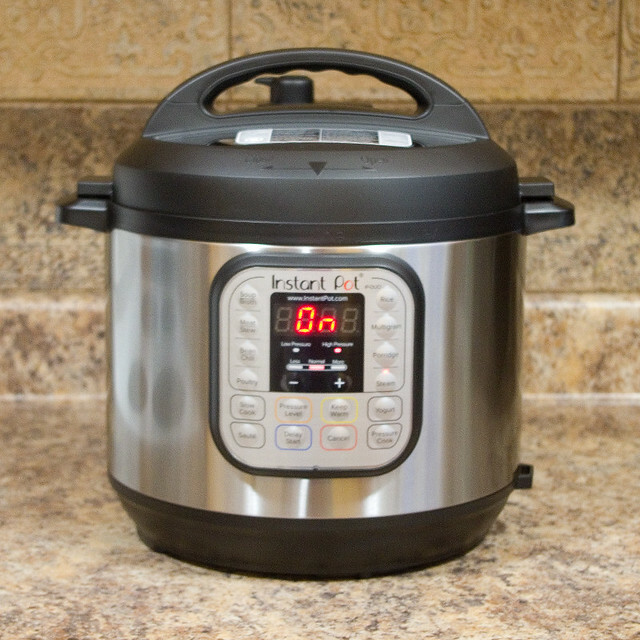 I found that the Instant Pot is much quieter and less scary than my traditional pressure cooker, which is enormous and I generally only use for canning things anyway. I did take a tip from BuzzFeed and popped a half dozen eggs into the pot while I was doing the initial test run. With a two minute cook time (plus preheat) and a quick pressure release once the timer was done, the eggs turned out perfectly cooked! So this tip is definitely confirmed. Now, my usual method is directly from the Joy of Cooking: put large eggs in a pot, cover with cold water, bring to a boil, then remove the pot from the heat and let it sit covered for 17 minutes. 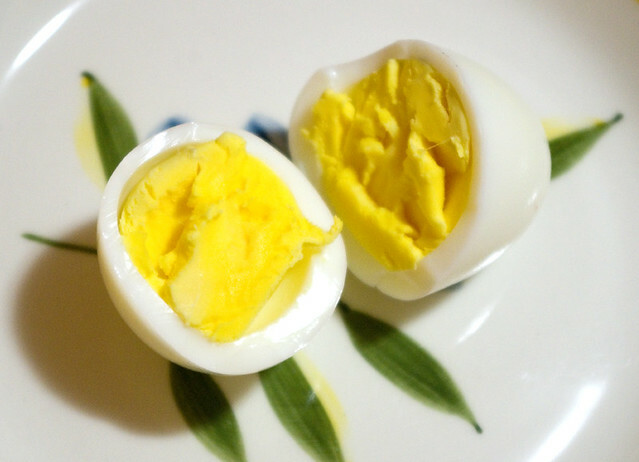 While this has unfailingly yielded perfect hard-boiled eggs, the Instant Pot is definitely faster, even with preheating time. I am pretty darned impressed. 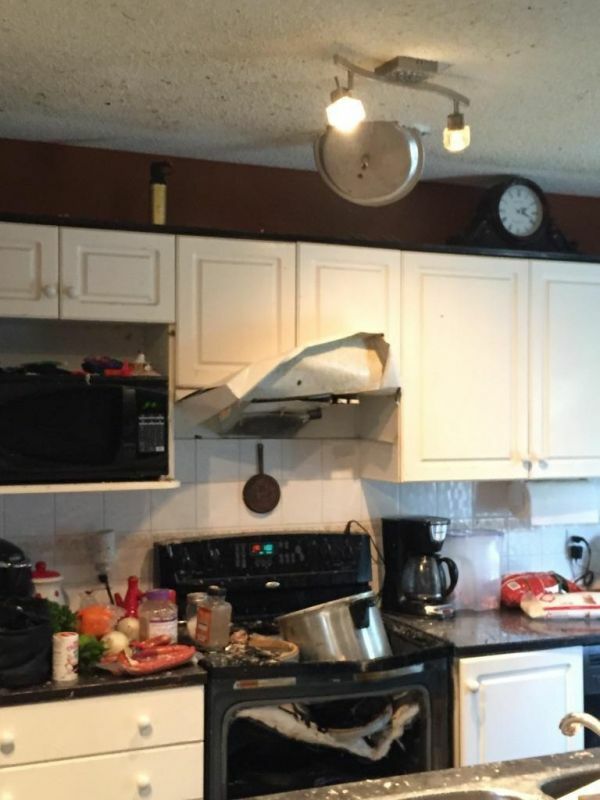 I guess I need to make a proper meal using my Instant Pot soon then, don’t I? I spent most of that day with my little family decorating the house for Christmas. As of now we’re still not done, but that’s to be expected as we do Christmas almost as big as we do Halloween around here. 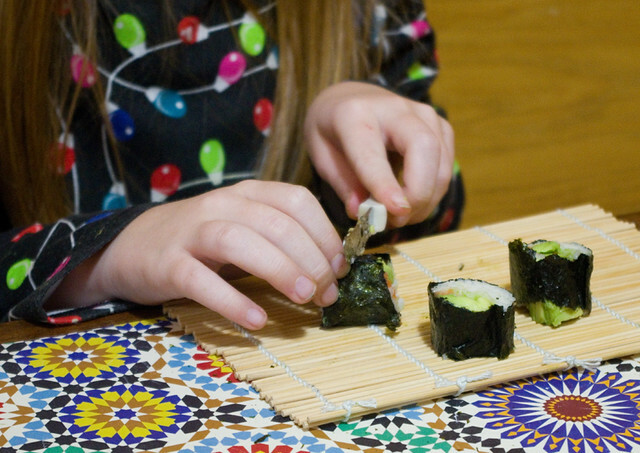 Of course, we had to take a break for dinner, which was roll-your-own sushi again at the kids’ request. Since this is a pretty healthy meal, I don’t mind indulging them. 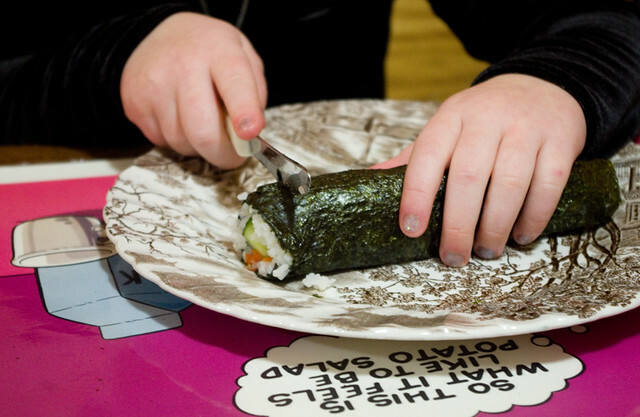 Their rolling skills are getting better, but their knife skills could use a bit of work. Part of their difficulty was the knives we used, though, which could definitely use a sharpening. 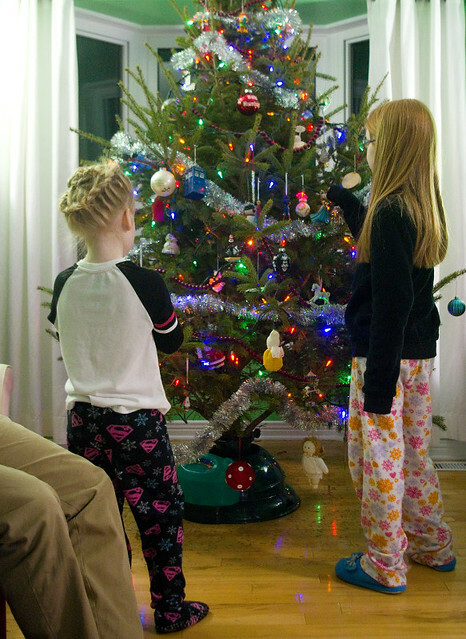 One thing we did manage to finish was decorating the tree, which is a real one in our house so it doesn’t stay up all that long. We find three weeks (two weeks before Christmas and one week after) is about as long as the needles will stay on. I know that the kids would be more than happy to have it up in November otherwise, although I’m pretty sure my husband would object. 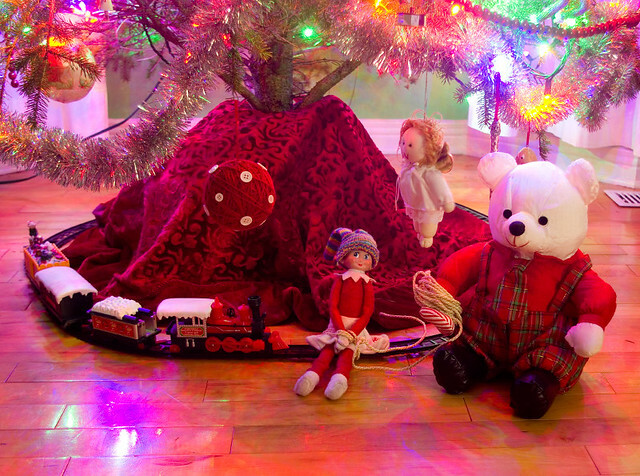 The addition of the tree and its decorations are, I think, the inspiration for the stuffed Christmas bear to tie Candy Cane to the tracks this morning. Although I do remember learning somewhere that there is actually no damsel-in-distress-tied-to-the-tracks scene in any old movie other than parodies; maybe I saw that on QI? At any rate, the elf is safe enough considering that the train has no batteries. Her predicament didn’t seem to bother the children at all. The Tuesday after Labour Day here in Canada means back to school for elementary school students in the public board. For my children, this comes with no little bit of anxiety, but as they get older I think it’s mostly balanced with a healthy dose of excitement. A big part of that excitement, I think, is getting to see their school friends on the regular again. Summer friends, i.e. neighbourhood friends and friends you meet at the park or wherever you’re traveling to, just don’t have the same staying power. Of course, some of their excitement is purely material. While we don’t do a full back-to-school wardrobe in our house, each kid gets a first-day-of-school outfit (they’re usually identical, since they surprisingly still enjoy that). 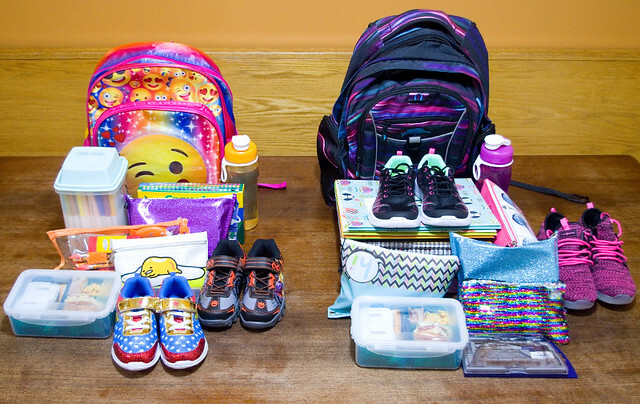 They also get new indoor and outdoor sneakers, as well as stacks of new school supplies in their favourite colours — mostly because they will have destroyed just about everything from the year prior by the end of June. 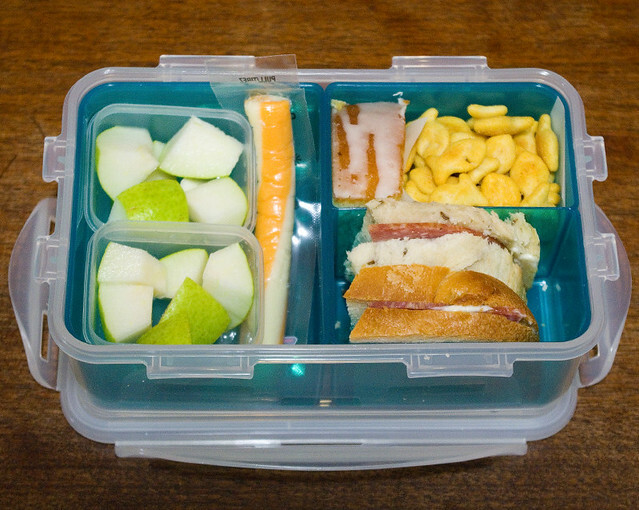 Although the kids are responsible for making their own lunches for the most part during the school year, for the first day I will generally do the honours. This year I’m trying to reduce the number of small containers sent to school because so few of them return (or return intact). Instead of lunch bags, this year I bought plastic, sort-of obento-style containers instead. Since everything fits in one box and the dividers don’t have to come out, I’m hoping that this means that less will be lost or left at school. 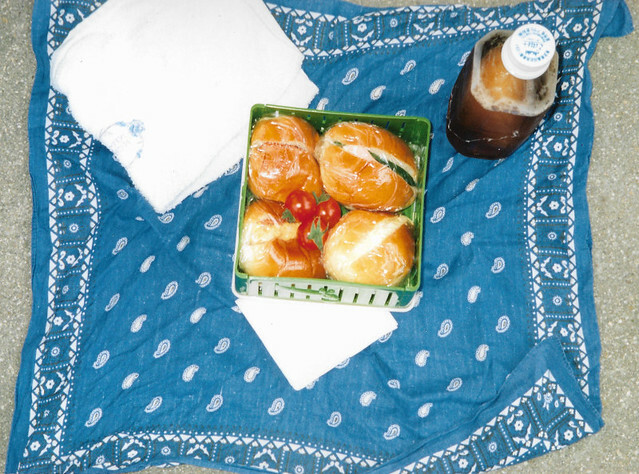 I was inspired by the lunches that I ate while in Japan on an exchange trip back in high school. I’ve seen some great videos on how school children in Japan help prepare and clean up from communal lunches, but that wasn’t a thing where I went (or possibly wasn’t for anyone in the time period I was there, I don’t know). Instead, we all “brown bagged” it, just like we do back here in Canada. The mother of the family usually woke up super early every day to make fresh obento boxes for her family. Mama-san, as she requested I call her, made some absolutely delicious food! I only too photos of two of the lunches; the one above is an assortment of little sandwiches, each one different, and a bottle of iced tea. And this one was a more stereotypical Japanese obento, with little bits of all kinds of dishes (it was so long ago that I can’t remember exactly what each one was, I just remember it was tasty), and some nori and I think a rice ball on the side. When the weather was nice — and we were there during a particularly gorgeous spring — we all sat outside, exchange students and hosts and other Japanese students curious about the foreigners. It was a lovely way to spend a lunch hour.